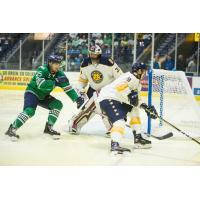 ESTERO, FL - Merrick Madsen stopped all 32 shots faced in his professional debut to help guide the Norfolk Admirals (2-0-0-0, 4 pts) to a tightly contested 1-0 victory over the Florida Everblades Friday night at Hertz Arena. The first half of the opening period was a feeling out process for both teams. However, just past the halfway point, the Admirals started to generate some shots and sustained pressure. After taking a shot that was stopped by Florida goaltender Jeremy Helvig, Norfolk's Matt McMorrow re-positioned himself just inside the left circle. Taylor Cammarata delivered a pass from the corner to McMorrow who snuck a shot over the shoulder of Helvig for the game's first goal. The goal was the first of McMorrow's professional career. Norfolk netinder Merrick Madsen made several quality stops for the remainder of the period to preserve a 1-0 Admirals edge. The Admirals continued to keep the Florida shooters in check during the second period and limited the Everblades to just 18 shots through 40 minutes of play. However, the 'Blades came out with fury in the third and immediately peppered the pads of Madsen who was able to turn the initial assault aside. The Everblades received a great opportunity to even the score when they received a 4-on-3 for a 1:27 span, but Madsen and the Admirals penalty killers closed out the penalty to preserve the one-goal edge. Madsen took care of the remainder of the period, and closed out the 1-0 win with a 32-save shutout in his professional debut. Helvig was also impressive stopping 23 of 24 shots.